Record keeping altered drastically in the 19th century. Although the change is thought of as a product of the Victorian age, it actually precedes the accession of Queen Victoria. The great transformation involved the government and civic authorities, taking over public records from the church. That meant that everything became centralised, one of the first great works of the modern state. The Act of Parliament that was passed in 1836 created the General Records Office, which would be the repository to collect the new birth, marriage and death certificates. It would be the first time this information had been gathered on a national basis and from July 1, 1837 recording all these events on state forms became mandatory. Prior to this, records relating to birth, marriage and death had all been kept locally by the parish churches (there were also marriage records at Quaker meeting houses and Jewish synagogues, the only other places allowed to conduct marriages). Once the new Act came into effect, the buildings belonging to other religious denominations could be registered to allow marriage ceremonies, a great leap forwards for the acceptance of other religions. The parish records didn’t actually record births, though – they recorded baptisms, which didn’t necessarily include the date of birth of the child. Deaths were recorded by burials. These things were fine, but certainly didn’t offer the kind of information a growing state needed. After 1837 all births and marriages had to be registered. 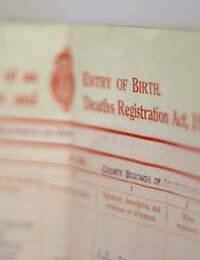 For deaths, a doctor had to issue a death certificate that listed the cause of death. These records were collected by a local records office and kept on file there. The General Records Office would collect the returns from these offices on a quarterly basis and keep them indexed at the central office in London. Each year would have a quarter ending in March, June, September and December. There was a brief limit to the information in the index, giving only the year and the quarter along with a reference number. From that the requisite certificate could be ordered (for a fee) by an individual. This collation of information represented a huge step forward and a realisation that the state needed to keep track of the population. By knowing who was born and where, and why people died, the challenges of a modern society could be fully addressed by government. Also vitally important was knowing just how many people lived in the country. That gave rise to the first census in 1841. This allowed the government to see how the population was distributed, how they lived, and what work they did, as well as the make up of families. Repeated every decade, they allowed changes in living to be recorded (the censuses covered England, Wales, the Channel Islands and the Isle of Man), to established how population altered and shifted. There were also censuses in Scotland, and the first Irish census had been held in 1821. Collecting these records represented the first centralisation of the entire state apparatus. The mechanism of administration meant that accurate, up to date records were necessary. Out of these rose many other things, such as public health, the increase in hospitals and police and fire services, not to mention the real beginning of large public burial grounds that were administered by councils, not the church, and eventually, allowing cremation. It might perhaps seem strange that changing record keeping could bring about such massive changes in public policy, but it was a necessary first step. So much of the society that we enjoy now is only possible because of the change in record keeping in the 19th century.